Today, I would like for you to meet Kim from The Very Busy First Graders blog! Her blog is super cute and filled with great ideas....like her Milk Mustache Posters and her Safari Reading Jeep - how cute is that?? Plus, she's having a giveaway that you can still enter! Hop over and take a look after you get to know her a bit below. Personal info (state/family/pets/interests):I live in Iowa with my husband and three daughters, 17, 12 & 6. We enjoy movies and games together as a family. We especiallyenjoy vacations! I think the kids would say their favorite place isthe Wisconsin Dells as they ask to go back every year! I love Colorado!My newest hobbies are blogging and creating items for TpT! I should be working on my 17 year old's graduation party/graduation...but I just can't do it yet and admit she will be leaving us soon! 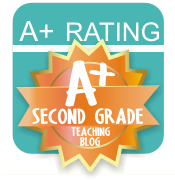 Grade You Teach:I teach 1st grade in a small rural PreK-12th school.There is one classroom of each grade level. How long have you taught?I have been teaching for 12 years. I started out in my current school teaching through a reduced classroom size grant.I taught Kindergarten through 3rd, following the same group of students,having a different mix each year. I averaged about 12 students in a very small room! I started over after 3rd and taught another group of students Kindergarten through 2nd. The position was being eliminated so thankfully the 1st grade position opened up! I have been in 1st every since and love it! I now average 24 students and next year will have 29! What is your favorite subject to teach?I love teaching reading! I have loved reading since I was little! There are so many amazing fiction and nonfiction books out there and great activities to go with them! I knew I would be a teacher one day! I would line all my stuffed animals up and play "Reading Rainbow" with them! I want to create that love of reading in all my little first graders and think I do that with books that interest them as well as by introducing new genres to them, getting into character while reading, creating fun reading spots (their fave is the loft!) and creating and buying fun activities centered around reading and books! I want students to know all about the places books can take you! What would we likely see if we popped into your classroom unannounced?You would see us singing and dancing to learn, working around the room duringDaily Five, working with partners and small groups and sitting at the meeting spotwhere so much of our learning takes place! What gets you through one of “those” days?My teaching buddies and diet cherry pepsi get me through stressful days with an occasional after school popcorn and M&M break! Thankfully there aren't too many of "those" days!! What is one “can’t live without” teaching resource?My laptop and interactive whiteboard are the teaching resources I can't live without! These two itemshave opened up the world to my small town students! Give us a glimpse of your teaching style by sharing a brief summary of a favorite classroom activity/project.I love getting students up out of their seats to learn! Some of our favorite activities are Scoot games,Read the Room activities, science experiments and data collecting. I would have to say our favorite projects are the class movies. I make three movies a year with the students that I burn on DVDs for the students to give their moms on Mother's Day during our Mother's Day Tea. We make a "When I Grow Up" movie abouttheir future career. They write the script and decide on costumes and actors for this movie. Our 2nd movie of the year is "The Peter Rabbit Operetta". We perform this live for our families during the school day as well as make it into a movie. They are in charge of costumes and we design props at school. Our last movie is for our Mother's Day Tea. We make the movie ahead of time so it can be included on the DVD which is presented at the tea. This movie is a combination of silly poems about families and funny songs with a sweet tribute to our moms at the end. What is one of your blogging goals for this year?My blogging goal for this next year is to keep sharing ideas with teachers and continue to meet new bloggy friends! Stop on by and visit! I would love to meet you! Hi Amanda! Thank you for showcasing my blog!!! I am so excited for the opportunity and hope I meet a whole bunch of new blog friends to share ideas with! 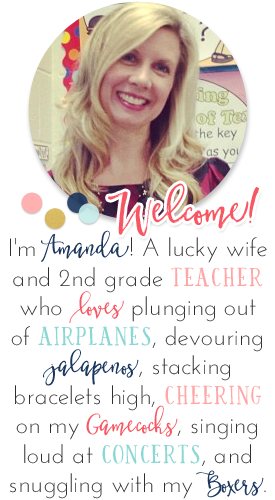 I didn't mention how important it is to me to share and get new ideas from fellow bloggers because I am the only 1st grade teacher in my school! 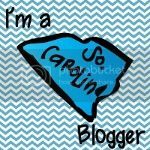 It is so sweet of you to do this for new bloggers! You make us feel so welcome! Thank you again!! !